The federal government posted some long-awaited details of its carbon-tax system last week, and they included significant changes from its original proposal. At their root, the tweaks are designed to reduce the carbon tax’s impact on heavy industry by increasing subsidies on production, which the government hopes will keep businesses from abandoning Canada for countries with lower taxes, or without carbon taxes. While the carbon tax will affect all of Canadian industry, the most significant changes affect just four sectors: steel and iron, lime, nitrogen fertilizers and cement. As well, the changes will apply only to provinces that haven’t come up with their own carbon-reduction schemes or that request it from Ottawa. However, the announcement comes in the middle of an escalating spat over carbon pricing between the federal Liberals and some provincial governments, and a trade war with the United States that has the potential to have far-reaching consequences for the Canadian economy. Here’s what’s new with the carbon tax, what it means, and why you should care. What exactly has the government announced here? Basically, Ottawa is increasing its subsidy to heavy industries that emit high levels of pollutants and that, under a system where those emissions will be taxed, it judged to be at a competitive risk vis-à-vis their competitors in other countries. It is not actually lowering the rate of the proposed carbon tax. The industrial carbon tax system works like this: a facility is taxed on each tonne of carbon it emits, but there’s a subsidy a facility can get from the government to offset production costs (how much it costs to make a widget.) It’s calculated in a tremendously complicated fashion, which Jennifer Winter, a University of Calgary economics professor, kindly explained to the Post. The government takes an industry emissions standard, calculated by how many emissions are made per widget produced and issues credits based upon that standard, explained Winter. Those credits were going to be set at 70 per cent of industry standard. The revised proposal would set them at 90 per cent for the four heavy industries mentioned above. Basically, it increases the credits available to industry, indirectly subsidizing production costs. For other industries, it has gone from 70 per cent to 80 per cent. Those credits reduce the carbon tax payments those industries will need to make, and will be able be banked against future carbon emissions or sold to other firms. Companies won’t actually get cash from the government, Winter said. “The whole point of the subsidy is to ensure that firms facing carbon tax don’t need to increase their price all that much because their average production costs, given the subsidy, don’t rise all that much,” said University of Calgary economist Trevor Tombe. The idea is that if a company can increase the gap between its carbon tax cost and its production (ie., produce the same number of widgets — or more widgets — with fewer emissions) then it has found a way to both help the environment and pay less carbon tax. In the end, the point of the subsidy (and its increase) is “to prevent leakage of economic activity elsewhere,” said Winter. So are the Liberals essentially walking back their carbon tax plan? Academics spent Wednesday shouting themselves hoarse on Twitter: No, they aren’t, because the tax and the credit are two different levers the government has. The carbon tax remains the same per tonne of carbon emitted, so industry still has the incentive to emit less. The credits subsidize the production costs of widgets. What this should do is ensure companies don’t attempt to emit less, thereby reducing carbon tax payments by way of producing fewer widgets. Okay. Does this affect me? Not really, unless you’re a steel producer. This is a separate carbon tax from the one you’ll see at the gas pumps. But it’s still important. Will this affect the fight between the federal government and the provinces opposed to the carbon tax? Not in any direct way, but the move has given rhetorical ammunition to some of the anti-carbon tax premiers. As news of the policy spread on Wednesday, Prairie politicians pulled out their iPhones and fired a few salvos at Ottawa. Saskatchewan premier Scott Moe tweeted that, by increasing subsidies, the government was essentially admitting the carbon tax will dampen Canadian competitiveness and hurt the economy. Jason Kenney, leader of Alberta’s opposition United Conservative Party, said it was a “major development,” tweeting that the federal government’s announcement was a sign that the “resistance from the provinces” was starting to work. The background to all this: in April, the Saskatchewan government launched a constitutional challenge of the federal carbon tax, arguing it infringed on provincial jurisdiction over natural resources. If Kenney triumphs in next year’s provincial election — and polls consistently show UCP support around 50 per cent — he says he will join Saskatchewan in the fight against the feds. On Twitter, Kenney stressed that he was focused on how the carbon tax affected things like home heating and gas bills, and not heavy emitters. 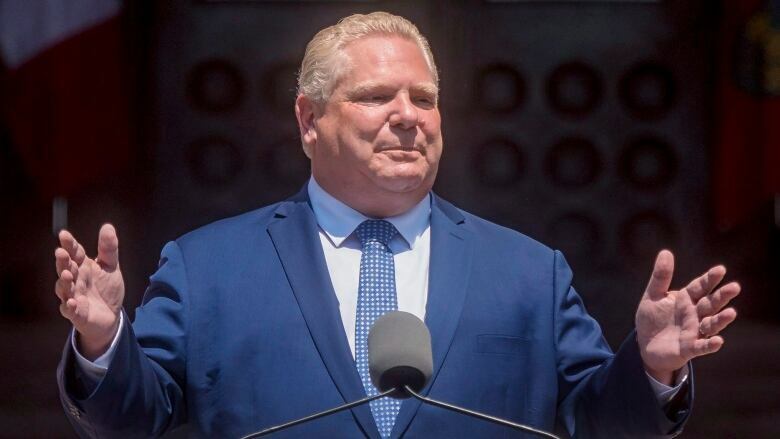 Recently elected Ontario premier Doug Ford is winding down that province’s cap-and-trade system and has vowed to fight any attempt by the federal government to install the carbon tax as a backstop. Subsidy or not, that battle will still be raging in courtrooms and in legislatures across the country. Is this basically all about Donald Trump? Maybe. One of the major difficulties in implementing a carbon tax in Canada will be is that our closest neighbour and biggest trading partner has no nationwide price on carbon. That means the big concern for policymakers is that Canadian businesses won’t be able to keep up with their competitors south of the border. “We don’t want to drive industry out of our country,” environment minister Catherine McKenna said on Wednesday, as she justified the policy to reporters. Economist Blake Shaffer described the changes as “smart policy” given the situation in the U.S. and other competing markets. There’s been no hint of action on climate change from the Trump administration or from Republicans in Congress and the U.S. government recently passed a massive corporate tax cut. On top of that, Trump introduced tariffs on Canadian goods going to the U.S. and has threatened to impose massive import taxes on automobiles.